If you doubt it, try running a company without any revenues. All of us all the time are being sold and selling. To win as an employee, at the least you must be good at selling yourself inside your firm. In most jobs, it’s the most important thing to driving your business too. Yet, because many of us think we already know what selling is, few people train. e.g. What leads someone to buy? Smart-sounding ideas is the norm, but none of us buy logic. Need a new iPhone already? e.g. How specifically do you clear an objection? Mitigating factors and counter-arguments are the tried and true approach for amateurs but pros play differently. 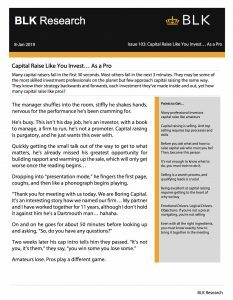 This 65 page research report on capital raising is selling in a specific context, but the method fits all contexts. We were told some of you had trouble downloading the report, so we put it here where you can access it directly.